10a.m.-6p.m. ; break hours: 01p.m.-02p.m. Days off: Monday-Tuesday. Was built in 1910 and firstly located on the crossroad of Gogolia & Lenina streets. In 1934 it was commandeered so its owners were have to move to their kids in Leningrad. There were many different offices in it and then in 1987-1987 people started to build a hospital block. The house became unnecessary and was transferred here. 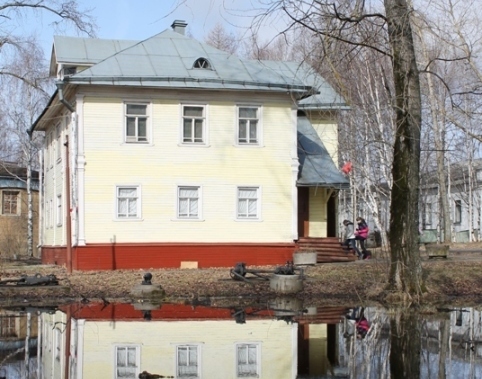 The Museum of Onega town was moved to this house in 1987. Working schedule: Tuesday-Saturday 09a.m.-05p.m. ; break hours: 01p.m.-02p.m. Address: The village of Verhovie, Zaiceva O.M. This museum is two-storeyed countrymen house («izba»). It gives a presentation about life and husbandry of northern natives. The interior with original objects of countrymen husbandry is reconstructed inside it. There is harmonic and traditional atmosphere of northern house – the Russian stove, the poker, the oven fork, cast-iron dishes, the wooden table, the Russian samovar, old-time utensil, icons behind the special towel handcrafted with red Russian decor, many photos on walls. It is a sense like a touch of past times. All visitors can acquaint with customs, traditions and rites of countrymen. You can take part in excursions to real farm. The village of Verhovie is located in the Lower Poonezhie. You can find it simply: the road along Onega river leads from Onega to Jarnema. Address: The village of Bolshoi Bor. The museum of rural husbandry was founded in 2006 special for 450-years anniversary of Bolshoi Bor. Its leader – Galina Vladlenovna Molchan. Historical documents, details of interior, different things of countrymen husbandry are collected here. You can acquaint with a history of beginning and evolution of this miraculous place. Exhibitions here are also dedicated to countrymen husbandry. Visitors can acquaint with a history of Kianda, life, traditions and customs of natives.